Strong outflow winds gusting to 90 km/h will continue this evening over the Fraser Valley, southeastern Metro Vancouver, Greater Victoria and the Southern Gulf Islands. With arctic air remains in place over the weekend, the arrival of this storm will potentially bring more snow to the BC south coast. For this event, the current computer guidance suggests that 5 to 10 cm of snow is possible for southern Vancouver Island and lesser amounts expected for the Lower Mainland. However, there remains some uncertainty with the storm track as the system develops offshore on Sunday. A slight deviation of the forecast track will greatly impact the amount of snowfall across southern BC. Please monitor subsequent forecasts for further updates on snowfall amounts. Highway 14, in both directions. Tree on road between Gillespie Rd and Connie Rd for 0.9 km (Sooke). High winds. Downed hydro lines. Single lane alternating traffic. Tree down blocking lanes both directions. Next update time Sat Feb 9 at 7:00 PM PST. Last updated Sat Feb 9 at 5:38 PM PST. Highway 14, in both directions. 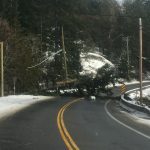 Tree on road between Glenshire Dr and Luxton Rd (Langford). Until Sat Feb 9 at 8:00 PM PST. Road closed. Next update time Sat Feb 9 at 7:00 PM PST. Last updated Sat Feb 9 at 5:38 PM PST. Highway 14, in both directions. Tree on road at Otter Point Rd (5 km west of Sooke). Road closed. Next update time Sat Feb 9 at 8:30 PM PST. Last updated Sat Feb 9 at 6:32 PM PST. #Sooke roads remain closed in both directions. Hwy 14 @ 5194 Sooke Rd near Manzer CLOSED for minimum 3 more hours. BC Hydro & Ministry of Transportation onsite. Multiple road closures east of Sooke, no detours available.